All of us at Events magazine favor the private sector A and a liberalized economy. Therefore, each time a new private unit emerges in a sector that has thus far been entirely or predominantly owned or controlled by the public sector we all feel delighted. 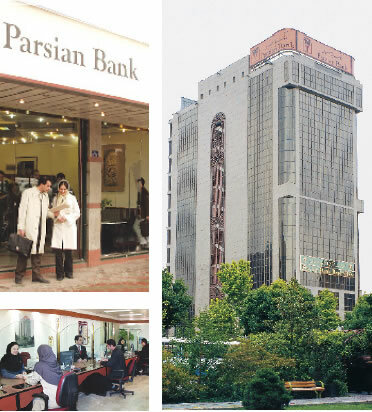 One such entity is Parsian Bank, an entirely privateowned bank which has been authorized by the Central Bank of Iran to operate with the same advantages given to it, and restrictions applied to it, as the public-owned banks. This is extremely good news in the "banking and insurance sector" which badly needs to be liberalized. Parsian Bank was established in 2001 with a capital of 300 billion rials. In 1382 it had a capital of 341 billion rials of which just over 160 billions (47%) belonged to real persons and 180.9 billions (53%) to legal persons. The real parsons numbered 37,702 and the legal persons 131. In the current year, 2004, the total capital amounts to 2,000 billions of which just over 90 billions belongs to real persons and almost 1,098 billion rials to legal persons (45% and 55% respectively). Initially each share of the Bank was worth 1,000 rials. Presently it is much higher but the exact fi gure will only be known soon when the Bank becomes incorporated into the Tehran Sock Exchange. The Bank operates entirely as a private bank but under the supervision of the Central Bank of the Islamic Republic, just as private banks were operated before becoming nationalized after the Islamic Revolution. Presently the bank has 43 branches and the balance of deposits with the bank on 21st August 2004 was 11,200 billion rials which shows a 60% growth compared to the year before. About 75% of this amount has been given as loans to various commercial, production, industrial, construction, service etc entities.